Two key House committees have launched a joint investigation into decisions the Department of Justice made in 2016 during the presidential election. 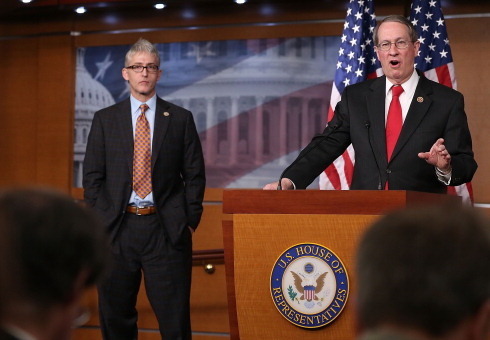 House Judiciary Committee Chairman Bob Goodlatte, (R., Va.) and House Oversight and Government Reform Committee Chairman Trey Gowdy (R., S.C.) announced the probe on Tuesday. Without mentioning then-FBI Director James Comey by name, the lawmakers said it would review several decisions the FBI made last year dealing with the investigation into Hillary Clinton’s mishandling of classified material while secretary of State, as well as its probe of campaign associates of then-candidate Donald Trump and their ties to Russia. "Our justice system is represented by a blind-folded woman holding a set of scales," Goodlatte and Gowdy said in a joint statement. "Those scales do not tip to the right or the left; they do not recognize wealth, power, or social status." "The impartiality of our justice system is the bedrock of our republic and our fellow citizens must have confidence in its objectivity, independence, and evenhandedness," they continued. "The law is the most equalizing force in this country. No entity or individual is exempt from oversight." The pair said decisions the Justice Department made in 2016 have led to a "host of outstanding questions that must be answered." FBI's timeline in respect to charging decisions. The pair said they will review these decisions and others better understand the reasoning behind how "certain conclusions were drawn." "Congress has a constitutional duty to preserve the integrity of our justice system by ensuring transparency and accountability of actions taken," they said. This entry was posted in Politics and tagged Bob Goodlatte, Department of Justice, FBI, House Oversight and Government Reform Committee, Trey Gowdy. Bookmark the permalink.